By taking your business outdoors, you can open new doors to income and exposure for your company. 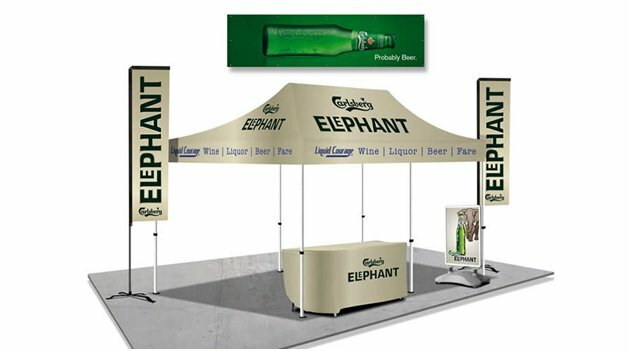 Investing in an outdoor tent display can help you engage with a whole new audience, and capture the eyes of new customers with our advertising kits. For many a business, the idea of an outdoor display sounds enticing, but the process of creating an entire set-up, with a tent, table, and signage, is intimidating. Happily, there is a simple solution that can fulfill all of your outdoor display needs: outdoor kits. Outdoor kits make displaying outside accessible by combining all of your outdoor display needs in one unit. It's like one-stop shopping for outdoor advertising! 9 Reasons Why You Should Consider an Outdoor Kit. Here, we'll discuss some of the many reasons why an outdoor kit might be just the right fit for you and your business. It's cheaper than buying everything separately. When you buy an outdoor kit, you actually save money, because everything you need is included in one single order. For instance, take a look at our Summer Pro Outdoor Kit. 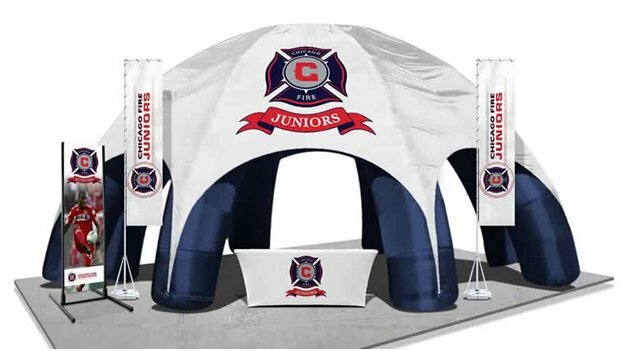 This comprehensive kit includes a customized tent, table throw, flex blade, and vinyl banner. Because it's all ordered at once, on a single sales bill, there is a single bulk setup fee, and you'll save money by purchasing and shipping everything as one unit. When you buy an outdoor kit, you can rest assured that it's professionally constructed. That is to say, the first breeze that comes along won't topple your tent! While of course no tent is completely immune to the elements, buying a quality product ensures that your display will be solid and secure and built for safe outdoor displaying and exhibiting. There's an option for every budget. Outdoor kits come in a variety of different options, so there's guaranteed to be one that fits your style, display needs, and perhaps most importantly, your budget. 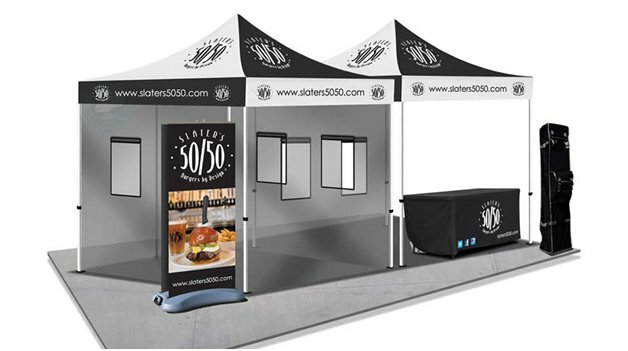 If you're just dipping your toe in the world of outdoor advertising, or you only see yourself using your outdoor kit on occasion, the Start Up Outdoor Tent might be just right for you, which includes a tent, tent roller bag, printed table cloth, and a vinyl banner. If you see yourself displaying outdoors a lot, you might be interested in a more involved display, such as our Outdoor Bronze Kit, which includes a tent, two flex blades, a printed table cloth, and a vinyl banner. An outdoor kit allows you to create an extremely impressive and professional look. Each element will have consistent print color and branding, which makes for a cohesive, eye-catching display that draws customer attention. Your branded display conveys an air of professionalism, which instills trust from the get-go in customers, and can help make the difference between a potential customer going with you or choosing another option. An outdoor kit helps you project the image that you want for your business. An outdoor kit allows you the opportunity to customize your entire display. 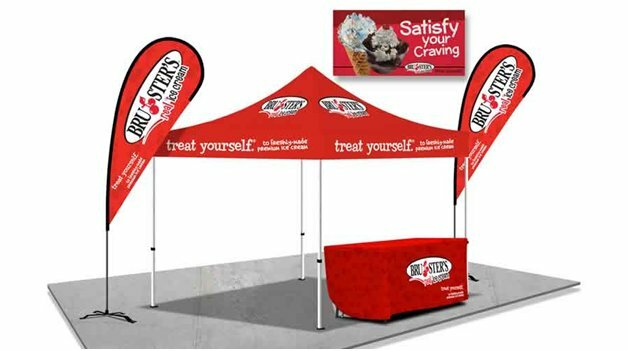 While it's impressive to have a customized display tent, the effect is compounded when you pair it with a customized printed table cloth and other signage options. The overall effect of this highly customized setup conveys an impressive look which uniquely reflects your business, and conveys an authoritative air to customers. The repetition of your logo helps it remain sharp in customers' minds! There's a kit for any type of business. An outdoor kit can be tailored for use by just about any type of business. For instance, our Food Service Tent is sized and outfitted with details like protective mesh walls which make it suitable for serving food at outdoor festivals or events. Our Deluxe Festival Tent features details like a brightly printed backdrop to catch the eyes of festival-goers as they walk by. Our Gold Outdoor Kit features a spider tent, which is a creative display option for a business that really wants to stand out and make an impression. No matter what type of business you have or what type of image you want to project, there's an option for you in our outdoor kit offerings. a. It can be used for outdoor events such as street fairs, concerts, or outdoor festivals. b. It can be used in your parking lot or outdoors of your brick and mortar business for events, promotions, or just to draw attention to your location or storefront.c. Some elements of your display can be used for indoor trade shows. Elements of your display can be used off-season. During the cold months or off-season for outdoor events, elements from your outdoor kit can be used indoors. The signage, table covers, and banners all have potential use year-round, even if you don't have any plans to display outside. Yes, we've already mentioned that it's cheaper to buy a kit than to buy all of the elements separately. But it shouldn't be ignored that it's also far easier to buy all of your outdoor supplies in one simple kit. It makes the workload easier on your graphic designer, who can set up and work on the same artwork concurrently, fitting it into different templates for the various display items included in a kit. It also ensures that the printing will be even and that your products will "match". And they will also ship all together, which is not only cheaper but makes it easier to keep everything in one place. Conclusion: Deciding how to approach an outdoor display for your business can be an intimidating prospect. An outdoor kit is a simple, one-stop-shopping solution, which can not only take a lot of the guesswork out of the process, but can help ensure that you have all of the high quality display items you need. An outdoor kit is a worthwhile investment for your business, and one that will serve you for years to come. Could your business benefit from an outdoor kit?